For people who like to be near the water, sailboats provide a means of skimming over its surface. Even when the water is frozen, iceboats (sailboats with runners or blades on the hull) can glide across the ice. The sailboat is a form of transportation, a type of recreation ranging from simple craft to the most elaborate racing yacht, and even a form of housing. A huge yacht with custom fittings and a crew is a symbol of wealth. A one-person boat with a tiny sail represents freedom. A majestic old clipper ship hearkens back to historic battles, the spice and tea trades, and sea legends like the "Flying Dutchman." And a bay or lake filled with sailboats and whitecaps with clouds rippling above makes a picture perfect for painting and a lasting memory. Sailing was once a hobby of the rich, but the availability of free time and more cash to the "average" person has made sailing one of the most popular forms of recreation. Sailboats may be handcrafted or factory built in all sizes from day-sailers and other boats less than 11 ft (3.4 m) long, to the dinghy, larger single-masted sailboats, two-masted boats called yawls, and large yachts. Yachts are patterned after historic sailing vessels called brigantines, cutters, clipper ships, and schooners. Boats used for racing are specially designed for speed and maneuverability, while sailboats of all sizes that have onboard quarters for passengers and crew are sturdier in design with more details for comfort. Many sailboats also carry inboard or outboard diesel-powered motors in the event they are becalmed (motionless from lack of wind) or their sailors simply want a speedier return to port. Of course, the sailboat is distinguished from other craft by its sails. A sail is simply a piece of fabric that is used to catch the wind to drive the boat across the water. Most modern sails are made of Dacron, a polyester fiber. Because the fabric is heated to meld the fibers together, the wind cannot escape through pores like those in woven cloth, and the surface has a very low friction factor. Polyester sails are also lightweight with little stretch. Sails fall into two major categories and then into many subclasses. The two major categories are square and triangular sails. Square sails are mounted across the main axis of the boat to use the wind pressure to power the boat. Wind strikes only the back, or afterside, of square sails. Triangular sails follow the same axis as the boat, with fore sails at the front or bow of the ship and aft sails at the rear or stem. Both sides of triangular sails are used for forward motion, and they can be adjusted to make the best use of the wind's force. The subclasses of sails are named for the pieces of rigging that support them or for neighboring gear. Masts are significant identifiers. A three-masted sailboat has a foremast, mainmast, and mizzenmast (toward the stem). Single-masted boats have a mainmast only. Two-masted vessels may have either a foremast and mainmast or a mainmast and mizzenmast, where the mizzenmast is the shorter of the two. Sails named for parts of the ship include gaff sails, jib-headed sails, spritsails, and lateen and lugsails. Sails are also named for specialized uses: summer sails are for tropical conditions, storm sails are used in bad weather, racing sails are needed only by racers, and cruising sails are the standard set for everyday conditions. A three-masted square-rigger can be equipped with as many as 20 sails with unique names and purposes. Animal skins were used as sails for the earliest boats and rafts. The Egyptians and other ancient people wove reeds together in mats to make sails, but the Egyptians were also the first to make cloth sails as early as 3300 B.C. Great sailors of the Mediterranean region like the Phoenicians sailed under cloth sails. Over the centuries, sails woven from a variety of fibers, such as hemp, flax, ramie, and jute, were sailmakers' favorites; but flax fiber was the primary material for sails throughout the age of exploration (approximately 1450-1650). Cotton gradually replaced flax as cultivation and processing of cotton increased. It was the victory of the racing yacht America in 1851 that crowned the cotton sail as supreme. This United States yacht defeated 14 British vessels in a sailing race around the Isle of Wight off the south coast of England and was the source of the name for the America's Cup Race, the greatest yacht race in the world. Sailboats themselves began as single logs and simple rafts. More sophisticated shapes for hulls that would cut through the water grew out of military use, but also from merchant sailors who built extensive trading networks crisscrossing the Mediterranean Sea. When day-sailers were built for fishing and recreation, they were essentially miniature copies of naval ships like schooners and cutters. The elaborate yachts that were the playthings of royal families and the wealthy also copied naval sailing ships. By about 1850, a new engineering discipline called naval architecture was begun to design efficient hulls and other parts of sailboats according to the laws of physics and engineering and architectural principles. Sails and rigging and their effects on the speed of sailboats were essentially ignored until 1920. Since that time, aerodynamics have been used in their design. Today, modifications to complex craft like the boats that participate in the America's Cup Race are based on wind-tunnel testing and many other sophisticated analyses applied to boats, water, wind, and sails. In parts of the world where waters are frozen for most of the year, iceboats were developed to skim the sailboat over the ice by mounting it on runners or blades. Archaeologists have found evidence of iceboats in Scandinavia dating back to 2000 B.C. Eyewitness accounts from Scandinavia, the Netherlands, and Baltic Coast countries like Latvia and Russia are much more recent, with the earliest from the seventeenth century. In the United States, the first known iceboat in the New World traveled up and down the Hudson River in New York in 1790. Like their warm-water counterparts, iceboats that race are called ice yachts, and ice yachting as an acknowledged sport dates from the nineteenth century. Sailboat manufacturers either fabricate their own parts or order them, depending on the intended volume of production. Items that are usually provided by specialty suppliers include masts, sails, engines, and metal fittings. Boatbuilders make their own fiberglass hulls, however, and the materials used to cast reinforced fiberglass include Gelcote polyester resin, a catalyst for the resin, woven fiberglass roving, and fiberglass. Manufacturers who build hulls from wood similarly order, age, and shape their own wood. Roving is strand-like material that resembles burlap. It can be woven with biaxial, triaxial, or knit strands, and the designer specifies the type of roving depending on the planned design and weight of the finished sailboat; sailboats range from lightweight and very fast to strong and highly seaworthy. Manufacturers usually make several specific lines of sailboats. Their designs are drawn and printed on blueprints or drafted by computer design methods. When a design is new, a wooden plug is made from the blueprints to exactly match the configuration of the outside of the empty hull. The wooden plug is sanded, polished, and covered with a slick coating, something like boat-builder's Teflon, from which other materials can be removed. be perfect. The process of making a plug and mold is very expensive, so the designers must be sure of the plan on paper before proceeding to plug construction. Examples of different types of rigs. types of fittings on the sailboat and deck, engines, sails, and outfitting of any interior. These items are ordered from specialty suppliers in advance of production. Manufactured sailboats typically range from 11-ft-long (3.4-m-long) day sailers to 28-ft-long (8.5-m-long) and sometimes longer luxury craft equipped with diesel motors and living quarters. The process described below is for the construction of small, fiberglass craft, but some remarks address larger varieties. Building the hull of the sailboat begins from the outside in. The contact surface along the inside of the mold is the outside of the hull. The mold is lined with a parting agent—a non-stick coating that will help release the sailboat hull from the mold when the hull is complete. Color pigment is laid against the inside of the mold; effectively, the "paint job" is the first part of the sailboat to be made, although the pigment incorporates into the outermost fiberglass and resin. Sailboats can be colored in a rainbow of hues, thanks to the variety of pigments available. The skin coat of the boat is made with 4-5 oz (124-156 g) of blown fiberglass that resembles cotton candy. Unlike the roving that will follow, the skin coat fiberglass is random-strand fiberglass that is blown in and then spread by hand. The skin coat is about 5 mils (0.005 in; 0.13 mm) thick, but this is enough to keep the pattern of the roving from bleeding through to be detectable on the outer finish of the sailboat. Gelcote is applied to harden the fiberglass. This chemical resin reacts with a catalyst that causes a chemical reaction that converts the pliable fiberglass into a hard material. Woven, 24-oz (746-g) fiberglass roving is placed against the skincoat. Layers of roving are rolled out by hand and are bound together for reinforcement and built up for thickness and strength. It is also pressed and molded into shape against the outer layers and the mold itself. Gelcote again is applied to begin the hardening of the fiberglass. The resin and catalyst are sprayed on with a carefully metered spray until the roving is saturated. After the Gelcote is applied, the fiberglass workers have 30-40 minutes to finish manipulating the fiberglass while it is in a state somewhat resembling cookie dough and before it begins to harden. The process of building up the fiberglass and spraying on the resin and catalyst is done in a temperature-controlled room in which the temperature is maintained at 72°F (22.2°C). Workers laminate the fiberglass for one-half of the hull (i.e., one side of the sailboat) at a time. Each half then cures for 24 hours to allow the catalyst to complete its chemical conversion. The first layers of the remaining half of the sailboat are laminated and cured, and the workers then return to the first side to continue adding more layers to thicken the hull. Boats in the 18-to 24-ft-long (5.5-to 7.3-m-long) size range are typically made of three layers of roving. During the process of "glassing" the boat, stiffeners are also added to the hull. Sections of precut and preformed marine plywood are laid in the bottom of the empty hull. As more roving thicknesses are added, the plywood is glassed into place; the resin and catalyst harden the plywood into place as structural components of the fiberglass. Depending on the design and size of the sailboat, the plywood components may consist of a system of stringers, ribs, and bulkheads that strengthen the boat against the impact and bending forces of waves. In another part of the glassing room, the deck of the sailboat is being constructed. A corresponding deck mold is made. Like the lid of a shoebox, it fits over the top of the open hull and is mechanically fastened in place. The fiberglass deck is made by exactly the same process. A parting agent is applied to the underside of the deck mold (the upper side of the deck), pigment is placed, and a skin coat of blown fiberglass is sprayed on followed by application of the resin and catalyst. The layers of the deck are built up of fiberglass roving, stiffening sections of marine plywood are glassed into place, and special reinforcements are laminated into place wherever hardware or fasteners will pass through the deck. Reinforcement pieces are made of marine plywood or aluminum. When fiberglass laminating has been completed on both the hull of the sailboat and its matching deck, the thoroughly cured sections are removed from their molds. A wooden wedge is driven between the mold and the fiberglass section, and the section pops out. Alternatively, the mold and section are submerged in water, and the water pressure between the two pieces pops out the fiberglass section. A chain hoist is used to lift the section out of its mold, and it is placed on an assembly cart so workers can move and access it easily. The assembly phase begins with "green trimming," a process in which bits of flashing (fiberglass and resin excess) are trimmed off. The deck and hull sections of the sailboat are sanded and cleaned, all edges are checked for smoothness, and all joints are inspected for precise fit. Obviously, larger boats require many more assembly steps than day-sailers. If the boat is larger than 22 ft (6.7 m) long, it will be fitted with a cockpit liner, interior liner, cabins, sitting rooms and areas, toilets (called heads on boats), and sleeping areas. Usually, larger craft are custom-built, and these systems are made of wood. John Cox Stevens, a wealthy New Jersey real estate broker and sports promoter, spearheaded the organization of the New York Yacht Club in 1844. As commodore of the NYYC, in 1850 he organized a syndicate of five other club members that commissioned William H. Brown to construct a racing yacht. Following the design by George Steers, Brown finished America in 1851, in time for Stevens to accept an invitation from Britain's Royal Yacht Squadron to enter its race around the Isle of Wight. Pitted against 17 seasoned British boats, America started poorly but finished with a commanding lead and won the prize, a 100-guinea silver cup. Stevens accepted the trophy and kept it on display at his estate. After his death in 1857, the Cup became a trust of the NYYC. The Cup was first challenged in 1870 by the 113-ft (34-m) English schooner Cambria, The 84-ft (26-m) United States defender, Magic, won the 35-mi (56-km) race. For the next 132 years, the America's Cup remained in the United States. It was lost to Australia in 1983. The Australia II challenged the Liberty with Dennis Connor as skipper. At the next race in 1986, Connor won the Cup for the United States aboard the Stars and Stripes. The Cup was again lost in 1995 to New Zealand, who, in 2000, became the only country other than the United States to win the cup twice. The next challenge for the America's Cup is set for 2003. Plumbing is installed next. Flexible pipe is used. Hoses are needed from fresh water tanks that store water for toilets and showers (again, on larger vessels), and return hoses are also required to return dirty water to the onboard sewage tank. Electrical lines are installed in accordance with electrical code requirements. Engines (if any) and mechanical equipment are fitted into the sailboat next. If the boat has an onboard engine, it is fitted to motor mounts that are installed on stringers—structural parts of the hull. A propeller shaft and propeller are fastened into place, and the engine controls are hooked up. The green-trimmed and polished deck is inverted and fitted over the hull. A "dry fit" is done first to make sure the deck still fits the hull snugly. Mechanical fasteners made of stainless steel are passed through matching reinforced sections of the deck and hull. Before the deck is locked into place, a leakproof sealant especially made for marine construction is applied. The fasteners are then mechanically tightened. Deck hardware is installed. Hardware may include winches and turning blocks for winding lines and sails, rails, stays, and other features. Installation of hardware is an important indicator of the quality of the sailboat; the hardware itself, as well as the backing plates and locking nuts and bolts, must withstand heavy use and intense water action. Hardware is a very expensive part of sailboat construction; a single winch for a yacht made for the America's Cup Race may cost $20,000. The mast is the last piece of major hardware added. Inside the hull, a wooden block or shoe called a tabernacle is installed as a seat for the mast. Masts are usually made of aluminum for light weight. When the mast is seated on the tabernacle, wires called stays are used to hold the mast in place. The stays are made from stainless steel wire and custom fit to each sailboat; manufacturers usually make their own stays in-house to assure the correct tension to stabilize the mast. All wires (if any) for electrical connections and hoses for plumbing (if any) are hooked up and tested. If the sailboat is of the size and design to have windows in the cabin, templates are placed on the hull, and the outlines of the portholes are cut out. Sealant is added around the edges of the openings, and windows consisting of frames and glass are set in the openings. Additional sealant is applied to make secure seals. The painting of the exterior is checked for any mars or marks and detailed. Accents are painted on and feature tape is added for stripes and other decorations. Decals, numbering, and manufacturer's information is also added. Sails are made by sailmakers who are highly skilled in design and material properties. A sailboat manufacturer may provide the sailmaker with a plan or the sailmaker may measure the boat's rigging and design the sails from that. Mathematics enter sail design in estimating the stretch of a sail with wind pressure applied, and the curvature of each sail's surface is calculated. This curvature is called the sail's draft, and it provides forward motion from the wind just like the curved wings of an airplane provide uplift. The sailmaker's shop (called a sail loft) is a critical tool because the plans for each sail are outlined in chalk on the floor and to full scale. The fabric, which is usually polyester, is laid over the plan, and the outlines are transferred onto the fabric. Each sail shape is numbered. The sails are cut out according to the outlined dimensions drawn on them. Sails consist of several pieces, and these are sewn together with sail twine, a specialized fiber that is stronger than typical thread. When the sewing needle is threaded with sail twine, the twine is twisted to add strength, and wax is applied so the twine will hold that twist. After all the pieces of each sail are sewn together, reinforcement is added to the parts of the sail that will take the most strain. Patches (reinforcements) are added to each corner and tabling (a thickened hem) is sewn along the forward edge (called the luff) and the foot of the sail. When the tabling is completed, ropes are also sewn inside the luff and foot edges of the sail to reinforce these parts of the sail against stretching. Finally, hardware and fittings are attached to each sail. These may include metal slides, grommets, and reef points depending on the design of the boat and the purpose of the sail. The sails are shipped to the sailboat manufacturer, and sets are stored on the sailboats to which they belong. Quality control is a continual process. All fittings and materials received from outside suppliers are checked upon receipt. Items like electrical wiring are bench-tested before installation in the boats, checked immediately after installation, and tested again during a final quality check. Specialties such as glassing the fiberglass hull have critical requirements for temperature and placement. The Gelcote is applied against an indexing gauge because it cannot be too thick or too thin. Over catalyzing the resin produces intense internal temperatures in the material, and it cannot be worked. If catalyzing fails, the resin has to be chipped out—an expensive, time-consuming process. 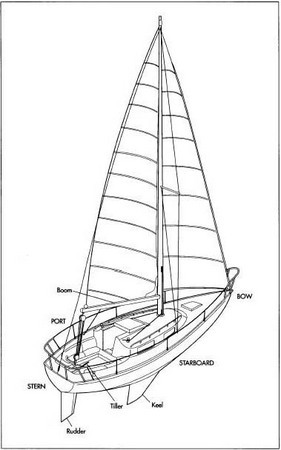 Errors in design of fiberglass thicknesses and placement of hardware as well as such errors in construction affect the weight and balance of the sailboat and how it will sit on the water; if the balance is off, the static list of the boat will be wrong. Details are also important, and quality control checks are scheduled so they are corrected immediately. An uncorrected mistake within the hull may not be easy to reach after the deck is fastened in place. The final quality check should reveal only minor problems like tiny flaws in the exterior that are quickly repaired. Sailboat manufacturers do not typically make byproducts, and they tend to specialize in several closely related lines. Only the largest companies have much wider ranges of products; their larger production allows an economy of scale in purchasing hardware and other supplies that appear to give them an advantage over smaller builders. Small builders know, however, that a lovingly crafted product is their boast, and they are willing to purchase smaller quantities (and waste less as well) in favor of custom quality. Waste is a minor issue. Most materials can be recycled, and the business requires such strict quality control that waste is minimized by careful workmanship. Safety is a major concern, by contrast. Thirty years ago, the manufacture of sailboats was unregulated, and many boat builders ran "cottage industries" in their back yards. Regulations have made this almost impossible. Workers are trained in safety issues, particularly related to air quality, and they must wear respirators throughout the construction of fiberglass hulls because of the fumes generated by the catalyzing process. Air emitted from the building must also be controlled in accordance with the regulations of the U.S. Environmental Protection Agency (EPA). Workers wear Tyvex suits to guard against splashing hazards, and chemicals are carefully stored and disposed according to regulatory requirements. Sailboats are symbols of beauty and freedom. They are highly desirable forms of recreation and symbols of success, independence, and free time. Periods when the economy is strong lead to greater sailboat production and more sails visible on local bodies of water. A sailboat as a retirement home is the dream of many. The variety of sizes of sailboats suits them to a similar variety of lifestyles. All of these aspects seem to insure the future of the sailboat. They are a simple, elegant, and ancient form of transportation made modern; they also provide opportunities for people to enjoy that unique environment where the wind meets the water. Gustafson, Chuck. How to Buy the Best Sailboat. New York: Hearst Marine Books, 1991. Hines, Vernon. About the America's Cup. Grand Junction, CO: Bookcliff Publishing Company, 1986. Kentley, Eric. Boat. New York: Alfred A. Knopf, Inc., 1992. Marshall, Roger. Designed to Win. New York: W. W. Norton & Company, 1979. Boat Talk Boating Information Bureau. http://www.boattalk.com (October 1,2000). Glen-L Marine Designs. http://www.glenl.com (September 29, 2000). Martini Marine. http://www.martinimarine.com (September 29, 2000).